Just Marvy! 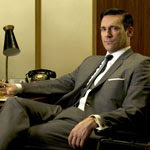 : Did Mad Men just jump the shark? Or nuke the fridge, whichever your preference. Donald Draper is like the coolest character on television, right? So on yesterday’s Mad Men, to get a female manager of a client to do as he says, he slips his hand under her skirt, says some threatening words and of course, in the next scene she’s obeying. Wha? Who writes this crap? Why do men (and female Cosmo writers) believe there’s some button on a woman that if pressed makes her power down and lose control, totally at your will and command? What is this, the nineties? No seriously: The nineties was the most ridiculous decade. You had a thousand vampire movies (bite her neck, she totally loves it), the movie Fear, and of course, the hundred romance books where the heroine is constantly about to be raped by the dashing earl because he thinks she’s not a virgin, therefore spoiled goods. Until he finds out she is, then he cares about not taking her “maidenhood”. Spoiler: They always live happily ever after.